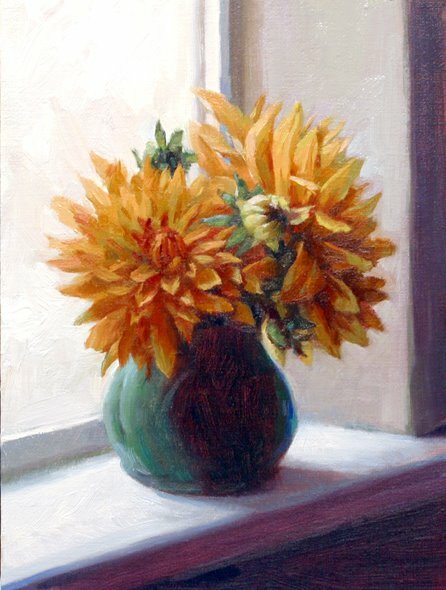 Star Wars "Forces of Destiny"
I saw some orange dahlias a few weeks ago and bought them so I could set up a still life for painting. I was surprised they lasted long enough to do two paintings - two weeks. When I looked up the historical meaning behind dahlias, I found that in the victorian era dahlias represented enduring love because they last so long. I like the shadow and light effect I get from placing flowers on this windowsill. When I set up still life objects for painting, I'm always looking for strong lighting. For me, strong lighting illustrates the idea of sun and moon, positive and negative, Yin and Yang. This painting has all the essential elements I believe in, plus one: Earth, Sun, Moon, and enduring love.